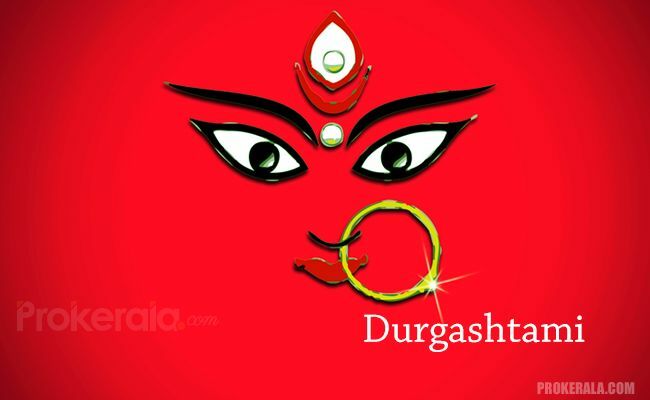 Durgashtami is the eighth day of the Navratri or Durgotsav festival that is celebrated across different parts of India. This day is attributed to Goddess Shakti, an avatar of Durga who is symbolic of eternal power and the victory of 'good' over the 'evil'. Durgashtami is celebrated on the eighth day of Navratri that commences from 'Mahalaya' in the Indian month of Ashwin. This falls in the Shukla paksha of the month. According to the Gregorian calendar, it is celebrated in the month of September-October every year. Goddess kali culminated from the forehead of Devi Durga on this day and killed Mahishasur — the king of Demons and his associates—Chanda and Munda. On this day, Mother Durga annihilated Bhairo Nath, an evil 'tantric' in the form of Vaishno Devi. This incident leads to the history of establishment of the pilgrimage of Vaishno devi and it is said that the famous Bhairo nath temple lies at the site where the head of Bhairo Nath fell after being chucked off by the Goddess. Durgashtami that is celebrated as apart of the Navratri festival is known as Mahaashtami. Devotees of Goddess Durga keep a day long fast on this day. On this day, all the weapons and artillery that were used for killing Mahishasur by Goddess Durga are worshipped along with the enchanting of mantras. This ritual is known as Astra puja. This day is also referred to a s Virashtami as several weapons, arms and martial art calibers are displayed by experts. During the worship of the Mother, the eight avatars of Durga called Ashtanayikas are also worshipped which include Brahmani, Indrani, Vaishnavi, Varahi, Narasinghi, Kameshwari, Maheshwari and Chamunda. Goddess Durga is worshipped by establishing a 'ghat' in front, red sandalwood paste, fruits, flowers, sweets, betel leaves, cardamom and coins are distributed among the kin. The Goddess is shown a lighted lamp for 7 times and the special Durga Satshati mantra is recited for 108 times. 64 Yoginis who are considered the Devi's associates are also worshipped along with. Other minor deities and guards of the Mother are also worshipped on this day that also includes Bhairava. On this day, the deity is worshipped as Goddess Gauri. To observe this, nine small virgin girls are worshipped, their feet are washed and they are offered halwa (a sweet disg made of semolina, milk, ghee and nuts), puri and kheer a part of the ritual. Several temples of the deity organize big scale pujas and 'havans' that are attended by devotees in large numbers. Durgashtami ends with the sandhi puja that ushers the next day Mahanavami. It is believed that people who observe a staunch fast on this day to please Mother Durga are always taken care by her benevolence and such people are always free of delusions of any kind in life.